Americans spend over $2 billion annually on high-protein dietary supplements, reported The New York Times in 2010. EAS 100 Percent Whey Protein Powder, which promises to help you build lean muscle faster, is one example. As a supplement, it's not regulated by the U.S. Food and Drug Administration and may contain potentially harmful compounds or more of certain nutrients than is healthy. Don't use EAS 100 Percent Whey Protein Powder until you've talked to your doctor about the potential side effects, and never exceed the amount recommended per day. One two-scoop serving of EAS whey protein powder contains 80 milligrams of cholesterol. If you consume up to three servings each day as the instructions suggest, you'll take in 240 milligrams of cholesterol, approximately 80 percent of the 300-milligram daily limit recommended for healthy adults. Unless the rest of your diet is extremely low in cholesterol, it's likely consuming EAS whey protein powder will cause you to consume too much. A high intake of cholesterol increases your risk of stroke and heart disease. The average healthy adult should not consume more than 2,300 milligrams of sodium each day. People over 51 years old, African-Americans and individuals with diabetes, kidney disease or high blood pressure should have even less, at 1,500 milligrams per day. With 170 milligrams of sodium per serving, three daily EAS 100 Percent Whey Protein Powder drinks would supply 510 milligrams, or over 22 percent of the limit for most adults and 34 percent of the sodium-restricted limit. The risk of hypertension, heart disease and stroke is higher for people who consume a large amount of sodium regularly. Men need about 56 grams of protein daily, while women should get around 46 grams. Each serving of EAS whey protein powder contains 26 grams. Consume two or more servings a day, and your protein consumption will exceed the recommendation. While serious athletes may require this high amount, if you're an average adult and consume more protein than you need, your body will turn it into fat, not muscle. Excessive protein intake can also cause dehydration and digestive problems like diarrhea, and exacerbate the symptoms of kidney disease or diabetes. It may increase your future risk of osteoporosis because high protein consumption can lead to calcium loss from bones. In 2010, Consumer Reports studied the contents of a variety of protein drinks, including one manufactured by EAS. The average EAS protein drink sample contained more arsenic and cadmium in three daily servings than is recommended as healthy by the U.S. Pharmacopeia, a nonprofit organization that monitors dietary supplements for safety, purity and effectiveness. Arsenic consumption may cause cancer and damage the nervous system; excess cadmium may harm the kidneys. EAS 100 Percent Whey Protein Powder was not specifically included in the test, but Consumer Reports cautioned that protein drink contamination is a widespread problem. Centers for Disease Control and Prevention: Where's the Sodium? CBS News: Could Protein Shakes Harm Your Health? 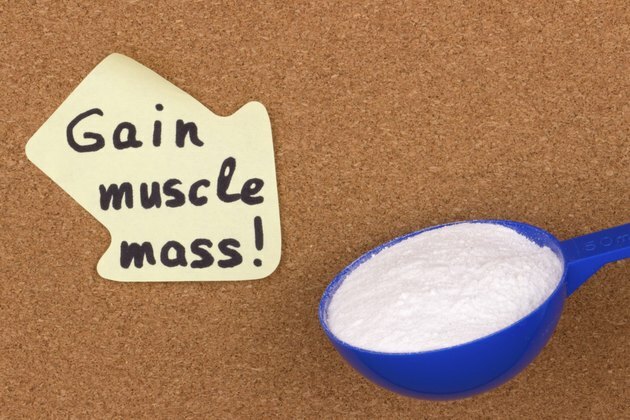 What Are the Dangers of Protein Powder Consumption? Is It Safe to Take in 200 Grams of Protein? How Much Protein Is Too Much for a Female?